Help us meet our $250,000 goal! Oklahoma State University's College of Engineering, Architecture and Technology (CEAT) is undergoing construction on our new state-of-the-art undergraduate laboratory facility: ENDEAVOR. With an overall goal of $35 million to construct this three-story, 72,000 square-foot facility, we are calling upon our greatest supporters to help us take a significant step into the future. With the longstanding partnership between ExxonMobil and OSU-CEAT, we are asking ExxonMobil employees and annuitants to consider giving to this new learning space and support the college’s success. Your collective support will add value to the quality of each CEAT degree earned at OSU by encouraging entrepreneurial ideas and developing tomorrow’s innovative leaders. With ExxonMobil's generous 3:1 corporate match, your combined contribution will help fund this defined space in ENDEAVOR. There are 14 primary laboratories within ENDEAVOR, and each laboratory can be named for a $1 million. 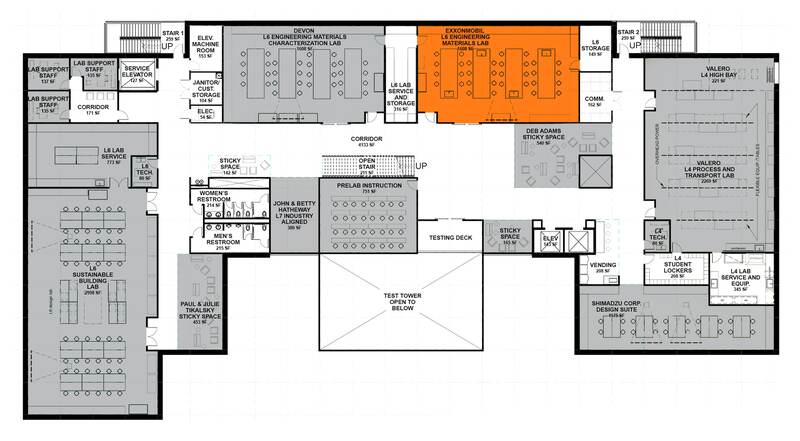 As shown below, the identified laboratory space to be named for ExxonMobil is prominently located on the second floor of ENDEAVOR, designated as the Materials Laboratory and visible to approximately 3,900 STUDENTS - EVERY YEAR. To achieve our $1 million goal, with the ExxonMobil match, aspire to raise $250,000, as your donations will account for one fourth of the goal. Commitments from several key members of the CEAT/ExxonMobil family have carried this campaign to the first half of our goal. We need your help with the second half! The impact of your generosity extends far beyond the construction of this facility. Your loyal support offers a better undergraduate experience to those who look forward to a career in engineering. Subsequently, your commitment will allow ExxonMobil to be intricately linked with the mission of this facility in a very significant way. This opportunity will also allow the organizational values of an energy company like ExxonMobil to be prominently displayed within the laboratory, allowing students who use this space with an the ability to learn more about your organization. 1) Click GIVE NOW or any of the giving levels to contribute a gift. Once you've made your gift, be sure to complete your match to maximize your impact on this project. 2) Pledge your gift over FIVE years. If you would like to spread out your participation to this project, please click this link to email LaRonna Wilbourn for a pledge form. She can help ensure your gift is counted towards our drive for $250,000. A donor plaque will be on display within the laboratory, acknowledging all donors who contribute to this campaign. No matter the size of the gift, we want everyone who experiences this laboratory to know that this was not the result of a singular corporate gift, but instead the product of individual alums who banded together to leverage their access to ExxonMobil’s generous matching gift program. The Endeavor's Materials Laboratory will provide students with an interdisciplinary experience in an innovative state-of-the-art engineering environment, where the vast majority of CEAT materials experiments will be ran. This suite of laboratories will affect every student and department in the college, and will be one of the most used laboratories. In this space, students will explore the range of materials such as polymers, metals, soils, fibers composites, nano materials, etc. ; as well as use a wide range of equipment from Instrons to X-ray Fluoresces Spectrometers. 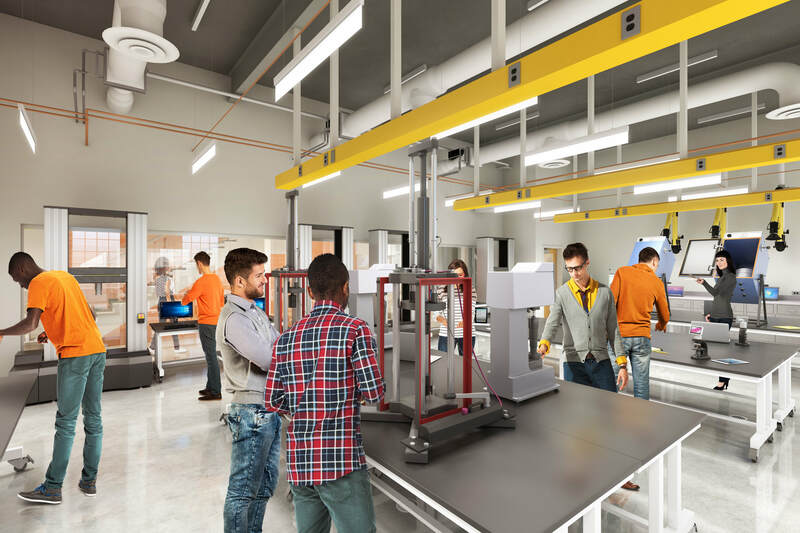 Special features of this laboratory suite include 400 square feet of vibrational isolate floors for students to explore nano-material technology, and a digital manufacturing makerspace for students to explore and use additive manufacturing (3D printing). CEAT will blend these unique features into material laboratories’ curriculum to provide our students with a best-in-class laboratory experience.